Purchasing your home is likely to be the largest financial commitment you will ever make. As with every important asset it is important to ensure you have the right protection in place to safeguard it for your family and give them peace of mind should the worst happen. This is the vital role that life assurance, critical illness cover and income protection play. The impact on a family of losing their home should a main breadwinner die, become critically ill or lose their job, would be devastating at what would already be a stressful time. At Key Solutions, everything we do is for one purpose, to make life easier and better for you and this includes ensuring that you not only get the right mortgage advice for your individual circumstance, but you adequately protect your home from the unexpected. This can be through taking out suitable life assurance or arranging the right buildings and contents insurance. Get in touch with our gang of protection advisers for help with arranging suitable life or income protection to meet your needs. Call 0800 138 5856 or send us an email and we will give you a call back within 24 hours. Life assurance – these policies pay out a lump sum in the event of the death of the life assured (the person / people paying the mortgage) so that the mortgage can be repaid. Typically provided by a term assurance policy which provides covers for the term of the mortgage. The policies can be level (where the amount paid out remains the same), or decreasing (where the amount paid out reduces over time to match the outstanding level of a repayment mortgage) in which case the premiums would typically be cheaper. Critical illness – these policies pay out either a lump sum or monthly payments in the event of one of the policyholders being diagnosed with a serious illness or injury (from a list of illnesses defined within the policy). The funds can either be used to repay the loan, replace lost income or cover the cost of any treatment as desired. As with life cover, the amount paid out (sum assured) can be fixed or decreasing and the policies can be taken out on their own or along-side life cover. Income protection – these policies provide a regular income in the event of the policyholder being unable to work through illness or injury. They will calculate a percentage of your salary and pay that out on a monthly basis after an initial set period (selected at the start) and continue to pay out until you either return to work, retire or the policy term ends. The level and type of protection you need will depend on your individual circumstances. Whether you are single or married, have children or your working or retired – everyone’s needs are different. Our experts will work with you to establish what the right level of cover is for you to ensure you are fully protected. If you are unsure about which type of policy would best suit your needs, contact our gang who will be happy to help on 0800 135 5856 or complete our contact form and we will call you back within 24 hours. Winston Churchill said of why the assurance industry exists: “To fulfil a duty of care, a vital social purpose. To provide financial security at some of the most tragic and often challenging moments in peoples’ lives”. “If I had my way, I would write the word ‘insure’ upon the door of every cottage and upon the blotting book of every public man, because I am convinced, for sacrifices so small, families and estates can be protected against catastrophes which would otherwise smash them up forever”. Did you know that if you suddenly suffered an unexpected change in your circumstances and your income stopped, on average, it would take only 26 days for your money to run out. This reduces down to 11 days for working age families. One of our Life Assurance partners, Legal & General have compiled a detailed report looking at how household savings and expenditure are measured in relation to how long a household could sustain their current levels of spending before savings are exhausted. Called Deadline to Breadline it includes some alarming findings – take a look below at a snapshot of the main findings. Although the average Deadline to Breadline, as reported in 2014, was 26 days. This figure can actually dramatically vary based on the location within the UK. 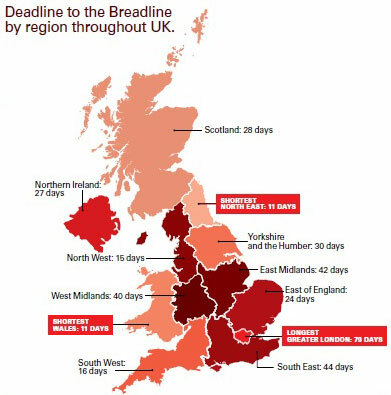 Unsurprisingly Greater London had the longest deadline at 79 days, whereas falling to the bottom with just 11 days was Wales and the North East. These figures are supported by the average household savings by region. With Greater London saving on average £13,910 over a 6 month period, whereas Wales falls to the bottom at nearly half of that of London at only £7,360. With results in the report also showing improvements to results taken during June 2013 and November 2013. The results highlight the breadth of the disparities which exist with London and the South East pulling away from the rest of the UK. In 2014 the findings showed that on average a family in the UK could survive 26 days if the main breadwinner became suddenly ill, was unable to work, or passed away. What is a more shocking figure is that this is dramatically reduced to 11 days for working age families (18-64). This shows that older families are more prepared given that they have larger savings, but 26 days is still not a long period of time. With the actual deadline clearly defined during this time as 26 days for the average for the UK. What is surprising is the reality of this figure in comparison with the perception Brits have. Most people think that they have 72 days before they reach the deadline, which is three times higher than the correct figure. You can read the full findings from Legal and General’s 2014 Deadline to Breadline report by downloading the PDF below. In 2017 Legal and General produced some updated findings which represent how the UK economy and the saving habits of Brits have changed over the past three years. Keep reading to find out how the figures have changed. Findings from the original report detailed that it would take 13 years for households to save one year’s average wage of £27,000. 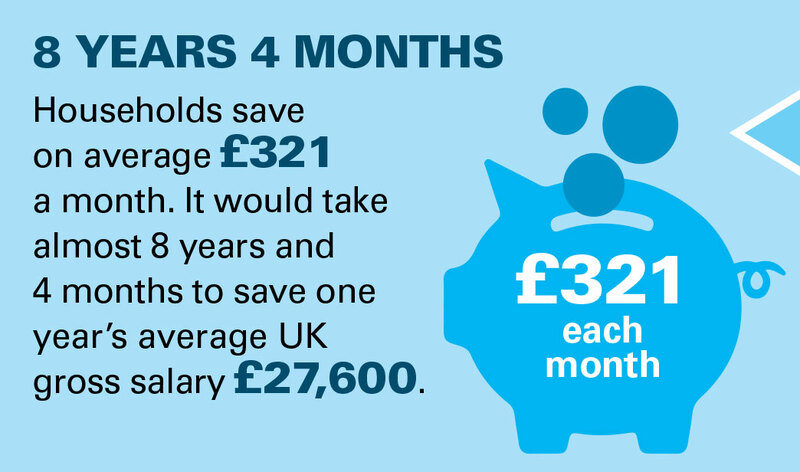 This figure is based on average monthly savings of £175. Similarly to the positive change to the deadline figure. Now it will take on average 8 years and 4 months for a household to save an average yearly wage with the average amount put away each month being £321. Interestingly enough, on average UK employees have £6,500 in savings, but to feel financially secure they believe they would need a further £9,830. Since the 2014 report was produced the average figure for the UK has increased from 26 days to 32 days. This still is not a large increase in the overall perspective especially considering that certain regions of the UK succeeded this figure already. This small increase can somewhat be attributed to the fact that 23% of families do not save a portion of their income each month. Similarly to previous statistics, Wales again appears at the bottom of the UK averages with a 26 day average, although this is a more significant increase. Interestingly the longest deadline is now Northern Ireland at 36 days. If you would like to find out what your personal deadline to breadline would be, you can use the calculator produced by Legal and General. And if you are concerned that you are not protecting yourselves adequately enough, contact us to find out more about Life Assurance, Critical Illness Cover, and Income Protection. Find out more about protection by calling the team on 0800 138 5856 for free. Or send us an email, we guarantee to respond to all enquiries within 24 hours.